Used to do a lot of the regular kind, never double dutch. Not sure I had even heard of it, when I was jump rope age. That was one of my favorite things to do with my sisters. So much fun!! YES! I loved double dutch and could even do a cartwheel through the ropes. 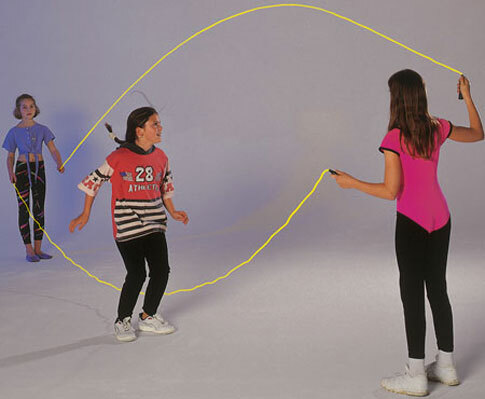 I miss being able to jump rope, so much fun! Double Dutch was unheard of in my small western MA town, but regular jump rope was done some at recess, complete with songs. I was never very good; clumsy, small and no stamina. The first time I was able to run into the already twirling rope and not stop it, I was so surprised I almost forgot to start jumping. I was never any good at this. My classmates hardly ever let me play any jumprope games with them anyhow. I do remember one of the songs being something about Teddy Bear. I was the nerd reading books on the playground. I remember being able to double Dutch in Jersey City when I was eight. But that knowledge is long gone! Loved skipping! Does anyone remember putting a rubber ball in a knee high sock and playing a game where you stood against the wall and banged it over your head and under your leg?